From the women's Ponderosa collection by UGG Australia the Athena is a zip-up deconstructed mid boot that can be worn up or cuffed down. Made in unlined soft camel suede and leather with a lateral side metal zipper with custom poderosa zipper pull. 71/2" shaft height. Insole plush Poron foam-cushioned footbed wih leather lined heel and 7mm curly sheepskin forefoot. 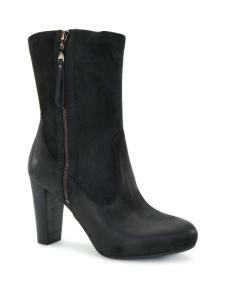 Heel 3 1/2" stacked leather wrapped heel with 3/4" hidden platform.